Is chain maintenance and oiling important? Addendum – What about lubing a hot chain? You should be inspecting and lubricating the chain about once a month, or every 400 miles. Whichever comes first. Next to tire pressure and chain tension adjustment, chances are that chain cleaning and lubing is one of the most neglected things on your bike. Which is a pity, considering how bad it can be when things go wrong. To make matters worse, motorcycle chain maintenance should be done pretty often. 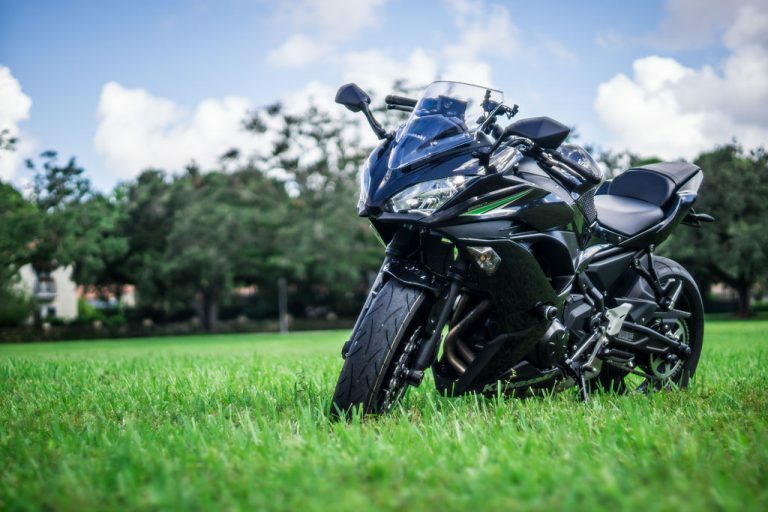 Kawasaki recommends lubricating the chain every 400 miles (600 km) on their bikes. I personally just try to do it more or less once a month after washing the motorcycle. Why do chains have to be oiled? Motorcycle chains have come a long way, believe it or not. These days most bike chains have O-rings between the pins and the plates which keep the lubrication in. The main purpose of chain lubrication is actually to clean the chain from debris and keep the o-rings supple. If chain lubrication is neglected, grit can get past the o-ring. Or the o-rings can shrivel up until they break off. For a more detailed read on the topic, checkout Wikipedia’s entry on Roller Chains. However, I won’t lie to you either. Plenty of riders neglect their chain the same way most cagers neglect tire pressure. But you’re better than that. 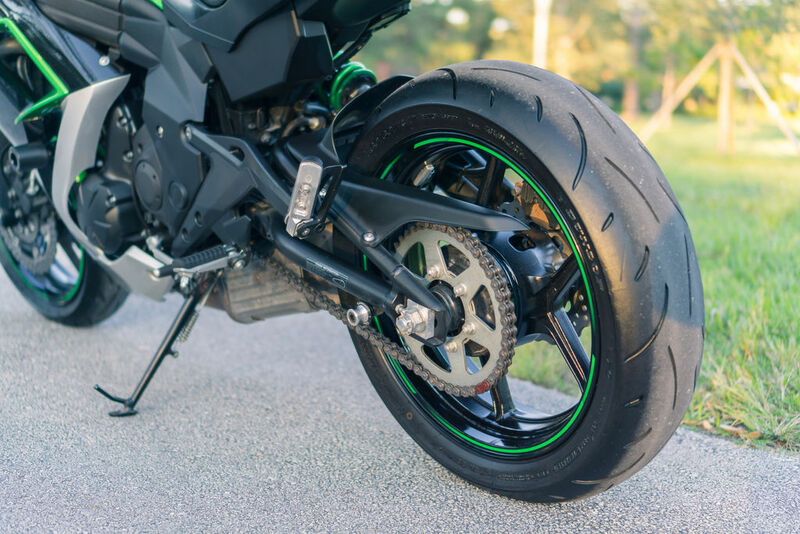 Proper motorcycle chain maintenance will go a long way with regards to safety and avoiding trouble down the road. 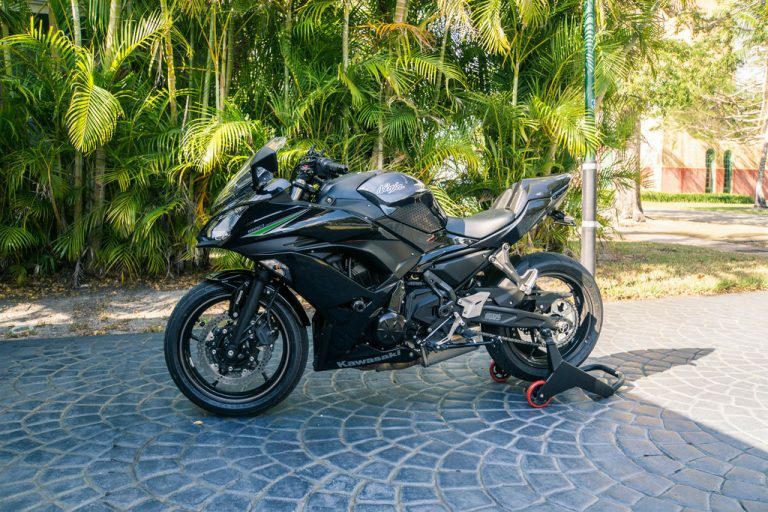 Plus, the day you try to sell your bike, it’s the first thing a buyer is going to look at. If your chain doesn’t look well taken care of, what are the chances the rest of your bike is? Garden hose – For rinsing the bike and chain, or feeding the pressure washer. Motorbike Rear Spool Stand – Like any bike how-to, you knew there was going to be a rear stand involved. If you don’t have one already, now would be the time. It’s a must-have for routine motorcycle chain maintenance. Bike Washing Soap – We’ll be washing the bike alongside the chain to do two things at once. So yeah, you’ll need some soap. This is what I used. 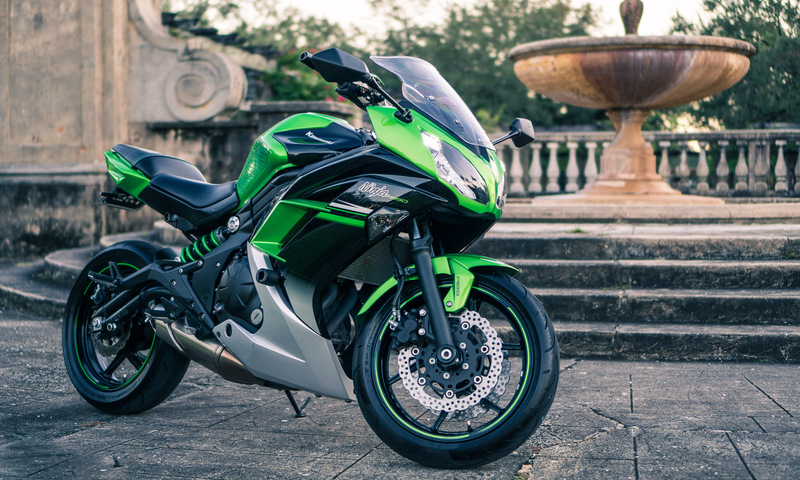 Its main advantage is that it washes and waxes the bike simultaneously. Though not as good as hand-waxing, it comes close as far as water-beading goes. Thick Sturdy Cardboard – If you have a large cardboard box available, great. If you have some waterproofing spray around too, even better. You’ll see why later. Box Cutter or Heavy-Duty Shears – I used this to cut the cardboard. Motorcycle Chain Cleaning Brush – This little thingy is actually pretty good for cleaning motorcycle chains. And it lasts pretty long too – a year or two used with care. Chain Lube– I use DuPont Teflon Chain-Saver Dry Self-Cleaning Lubricant. Whew, what a name. It’s consistently proven to be one of the best chain lubricants out there. Plus, it’s self-cleaning which avoids me having to buy another separate product. To boot, it does pretty well regarding preventing chain rust – Take it from a South-Floridian. Pet Training Pads – One of the biggest hassles of having to lubricate the chain frequently is clean up. I’ve found these to be a godsend regarding reusable ground cover. Boy do I love using a foam gun. It makes washing the bike feel festive! These are the tools we’ll be using for washing the bike today. Before soaping-up the bike, soak the bike as well as the chain. Take notice of the wide, diffuse stream of water. It’s going to help clean off the grit while not being so strong it gets water past the chain’s o-rings. The first step would be to clean the chain. You might as well wash the whole bike while you’re at it. Make sure to get a good amount of soap on the chain, too. I don’t bother with chain degreasers. Soap and water does the job perfectly well. The first step would be to clean your bike. Yup. Don’t kid yourself. Your bike needed a cleaning anyway so why would you just clean the chain? Plus, regular automotive soap is all you should need to remove superficial road grime and grit from the chain. This is how I do routine washing. I’ve got another guide where I show how to do a full motorcycle detailing. Anyway, the interval at which the chain should be serviced more or less matches how frequently most people wash their bike. That’s why I’d recommend doing both together. Furthermore, you should lubricate your chain anytime it gets soaking wet. Applying a decisive stream of water will do great to remove any dirt, grit or mud on the chain. That said, lets rinse off the bike. I used a portable electric pressure washer.Take notice of the wide water pattern which does not focus water on any one point. While bikes are “water-resistant/waterproof”, I’d really avoid using any sort of concentrated high pressure turbo nozzle on them since it can lead to issues. Especially on the chain. The fanned out water nozzle used here shouldn’t harm it. In case you’re wondering, I’m using an 6-in-1 quick connect nozzle and an adjustable pressure regulator to make the water stream softer. The next step is to cover your bike in soap suds! My weapon of choice is a foam cannon full of Wash & Wax Soap. By the way, if you don’t have a pressure washer and would still like to use a foam cannon with your garden hose, you can use this – Foamaster II Foaming Cleaning Sprayer. Make sure to get some regular auto cleaning soap on the chain. It won’t hurt. Let the bike soak in the soap. Once all the crud is softened give it a once-over with a microfiber mitt or sponge. Regarding the chain in particular, we’ll take care of that in the next step. At least not at its highest pressure, and not carelessly. If you do, the jet stream should be strong, but not so much that it would hurt your hand if you were to point at it (don’t do that). Use a pressure regulator if needed. The only thing worse than not lubing the chain is getting water past the o-rings. These cheap brushes are great for scrubbing the chain. Plus, they last a long time too. My last one lasted over a year. Once you’re satisfied, rinse everything off. Now that the bike’s clean, that’s one thing less on the to-do list! To help remove any superficial rust or grime, I’d definitely use a chain cleaning brush. They don’t cost very much and last very long (about a year), so it’s a worthwhile tool. Especially considering how frequently you’re supposed to lube the chain! Plus, it works so well that it is part of the reason why spending money on a chemical chain degreaser is unnecessary. Here is where the rear stand comes in useful, as it allows you to rotate the wheel to clean the whole chain. Honestly, I can’t even imagine cleaning a rim or lubing a chain without one. If you don’t have swingarm spools or a stand, now would really be the time to consider one. Once you’ve given the chain a few passes with the brush, rinse everything off with water. Personally, I am not fond of sprayable chain cleaners. At least not for regular use. If your chain gets dirty enough to need a degreaser between lubrication sessions, either you’re lubing wrong or waiting too long between lubing sessions. Or you’re an adventure bike rider – In that case, if your chain gets caked in mud then you’re doing things just perfect. I simply don’t see the need to spend the money and space on an extra unnecessary bottle. I much rather an all-in-one chain lubricant which provides both cleaning and lubing like the one I’ll be using here. By the way, if you ever do get your chain dirty enough to need extra cleaning, or it has a bit of rust, you can use WD-40 to clean the chain. While WD-40 is a mediocre lubricant at best, it’s an excellent cleaner. 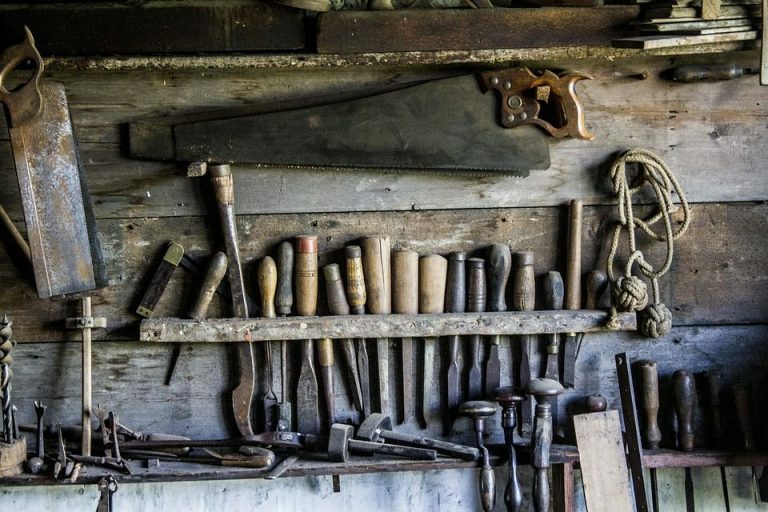 Rather than buy a different product, just use the can of WD-40 you probably already have. Just don’t use it for “oiling” the chain. This guard is to keep lube from getting on the rim. If you use some sturdy cardboard and waterproof it with a spray like this, it will probably last as long as the bike. Make yourself a semi-permanent rim protector to keep wax or lube from getting on your rim. The worst part about having to lube your chain frequently is how it splatters the rear rim full of gunk (yeah, the driveshaft BMW crowd is free to laugh. We deserve it). Even if you’re careful, lube always seems to end up on the rim. By making a little makeshift protector you can save yourself a lot of trouble, cleaning and hassle down the road. I just used one of the super thick cardboard fruit crates from Costco. Since I wanted it to last (and I live in “not always shiny, but always humid” Florida), I coated it with a waterproofing spray. 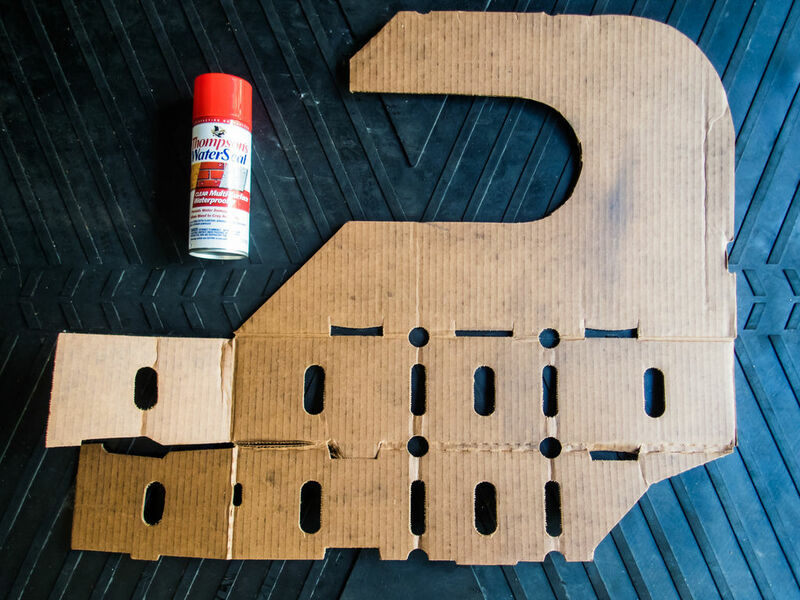 It will make the cardboard a little bit more sturdy, as well as help it stay sturdy. I used two coats. That should keep the humidity and any water drops from turning it mushy. Just use a box cutter or some scissors to cut it similar to what is pictured above. It should be able to fit on the bike while it’s on a rear stand, and should cover as much of the rim as possible. When lubing the chain, oil mixed with black road gunk always ends up dripping beneath it. Nowadays, I just use a pet training pad to avoid having to clean. As you’ve probably noticed from the stains, you can reuse them plenty of times. Most of the them are from previous chain lubrication or oil changes. This is what I use. For the price it’s among the best reviewed products out there. Pro-Tip: As you lube the chain, move the wheel forward so the lube drips from the top of the link to the bottom, lubricating it entirely. Concentrate the lube in this general area, making sure it gets between the two side plates where the o-rings are. Now it’s time to lube the chain! My personal favorite for this is DuPont Teflon Chain-Saver Dry Self-Cleaning Lubricant. It has nearly 5 stars on Amazon and it’s consistently regarded as one of the best products among reviewers. It’s easy to apply, non-sticky (so it doesn’t attract dirt and grit), contains Teflon and Molybdenum and it quickly dries to a clear waxy finish. Sounds good enough to me when it comes to chain lube. Personally, I like using the straw accessory to really concentrate the lube between the links. Where you want the oil to go is on both sides of the link’s pins (where the o-rings are). Applying it anywhere else is just for rust prevention. Also, as you lube the chain, move the wheel forward so the lube drips from the top of the link to the bottom, lubricating it entirely. 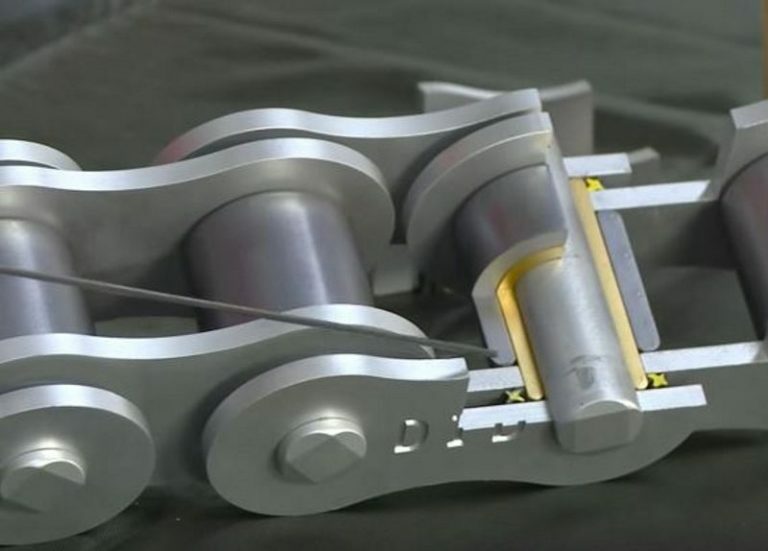 This cylinder, called the “Roller”, rolls at it moves along the sprocket. This really helps to minimize wear. Given how it’s always rolling that’s why lubing the “inside” or “outside” of the chain doesn’t matter. When doing motorcycle chain maintenance, I like squirting the lubricant at the chain at the rear of the sprocket. I find it to be the most comfortable location given how conveniently exposed it is. Since I use a very runny liquid spray lubricant, I can be confident that the lube will distribute itself around the rollers and O-rings. Any lube that drips on the sprocket will simply find its way down to the chain links below it, and all will be perfectly coated. After all, the rollers roll so it isn’t like there is an “inside” or “outside” to the chain link. Others may prefer to apply the lube elsewhere. Just do whatever works best for you. Though this lube is pretty clean (especially compared with other products), it will drip. I guess that’s part of the “self-cleaning” feature. That’s why I’ve gotten used to placing pet training pads (don’t laugh) under the bike. If you’ve seen my other DIYs, you might have noticed it in my oil change guide or the control cable lubrication how-to. They’re reusable and will save you a lot of time with cleanup. Nothing is more annoying while doing motorcycle chain maintenance than not knowing where you started while rotating the chain. Some chains come with a colored link, some don’t. If yours doesn’t do yourself a favor and mark it yourself with a permanent oil paint pen. And surprisingly, it won’t get rubbed off with use (I’ve had my chain marked for over a year). It definitely works better than a Sharpie. Wipe off the chain to remove any dirt that’s still on it. Normal paper towels disintegrate here, so I use those blue disposable shop towels. If you’re OCD (like yours truly), you can wipe off any lube that splattered onto the side of the sprocket. It isn’t doing any good there. Now that chain looks much better! After applying some lube, there still might be some black gunk on the chain. Or to be more accurate, there will be some black gunk on the chain. If you’re feeling motivated, give the wheel a few turns while you wipe the chain clean. The chain will disintegrate normal paper towels, so either be ready to use a bunch of them or use some disposable shop towels instead. They seem to fare much better. Once you’re done wiping, you can apply a quick last coat of lubricant if you want. I did. Let it sit pretty for about half an hour while the lube dries. Make sure it’s stopped dripping before you remove the ground cover. The only thing left is to let the lube dry. 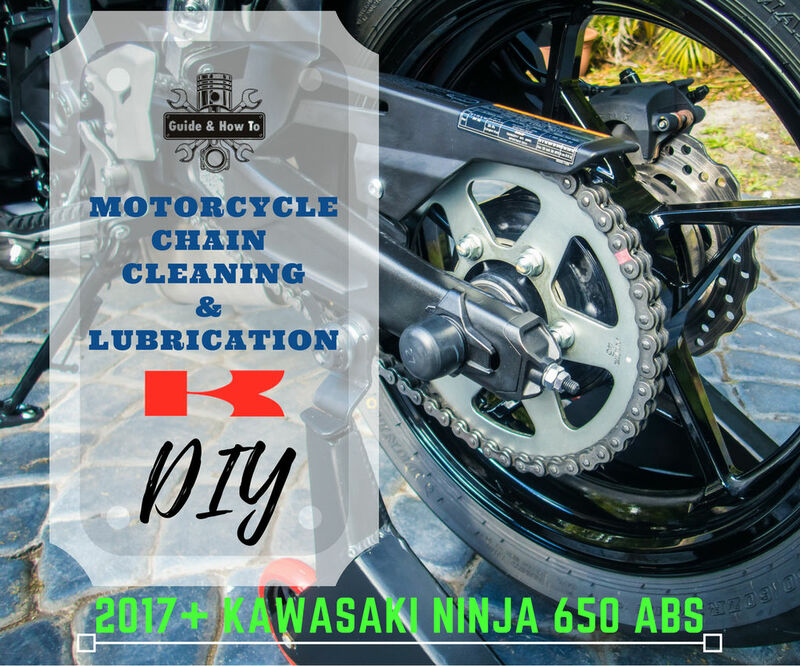 You want to give the lube about 30 to 60 minutes to dry, rotating the chain at least once or twice so any wet lube gets distributed. Don’t remove the ground cover until you’re sure it’s dry enough to not be dripping anymore. Especially near the front sprocket. After that, you’ve completely finished the motorcycle chain maintenance. See how doing good motorcycle chain maintenance isn’t that hard? If you’re really motivated, now would probably be the right moment to take care of the chain tension adjustment and alignment. Thankfully, there’s a DIY for that, too. Also, if you’re curious about what other things I’ve done to my bike, check out my 2017 Kawasaki Ninja 650’s Mod List. You might find something interesting. Some people like lubing their chain hot. I’d agree that there might be some merit to that. Provided it isn’t too hot. However, in the real world I think that the cons are greater than the pros. By all means, lube it right after a ride. Just don’t obsess over whether it’s still hot by the time you’re applying oil or wax. You’re free to disagree, but that’s my opinion. What matters is doing proper motorcycle chain maintenance. The how is much less important. If you lube your chain hot, it’s going to be while it’s still dirty after a ride. If you’re in the middle of a trip, that’s perfectly fine. Your chain is probably pretty clean anyway, if you cleaned and lubed it before the start. But if you’re lubing a chain as part of the bike’s monthly maintenance, then it will be relatively grimey. Brushing it off, applying any detergent and rinsing it off is going to leave the chain much happier. And by then the chain is already cold. Given that the main purpose of chain cleaning and lubrication is to remove debris that may damage the o-rings, as well as condition the o-rings to keep them pliable, heat isn’t very important. The gap for the o-rings combined with the relatively big tolerances are large enough for any expansion due to heat to make little difference. I sincerely doubt that there would be measurable real-world longevity benefits to lubing a hot chain. Though if there is proof of the contrary, someone please message me with a link. I’d be happy to look at it and correct myself. All in all, if you want to lube your chain hot without cleaning it first, go for it. If you’re capable of thoroughly cleaning it before it’s cold, awesome. Either way, kudos for taking care of motorcycle chain maintenance frequently. But for the rest of us riders that find that to be more trouble than it’s worth, lubing a cold or lukewarm clean chain is perfectly fine. Either method is infinitely better than the riders not lubing it at all.